Details : LUCARIS, Asia’s first world-class luxury crystal glassware in collaboration with Central Department Stores introduced the latest wine glass collection ‘Desire Collection’ in ‘LUCARIS Crystal Experience’ at Central Chidlom on May 20, 2017. 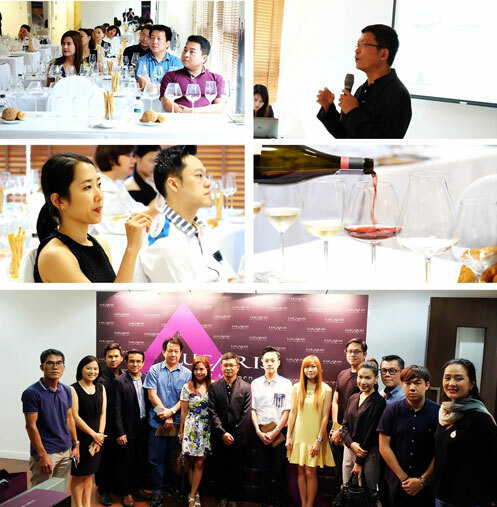 The event was conducted by Mr. Pairach Intaput, the President of Association of Thai Sommelier and a respectful wine consultant. Using different glass designs of the Desire collection, participants fully experienced the complicated taste profiles of wines perfectly matched with each Desire wine glass. The highlight is ‘Aerlumer®’ – the five bottom curl lines at the bowl glass, uplifting the wine sensory and enhancing the wine to perform at its best. The Desire Collection is co-designed and co-developed by Hong Kong Sommelier Association (Greater China) led by Mr. Nelson Chow, the President of the Association and the Vice President of ASI Asia Oceania.